This is a headphone review, if you're not interested in headphones, just skip down to the pretty pictures & continue on with your friends list. 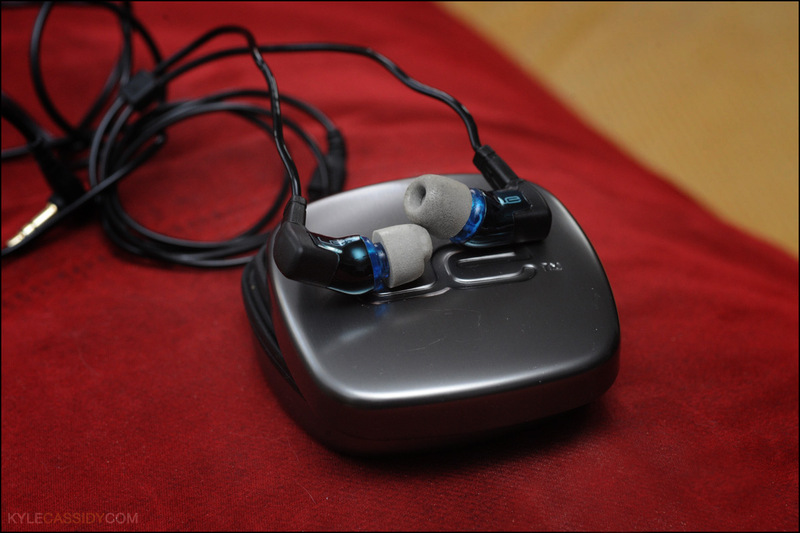 In April of last year I reviewed the Audio Technica ATH-ANC7b noise canceling headphones. I fly a lot and I wanted something that would work on airplanes. I won't go over the Audio Technica's here in detail, you can just read the review if you want to know about them, but they're over-ear and electronically cancel out noise with a set of microphones that make inside the earphones the opposite sound of what's being made outside the ear phones. This does a really good job of cutting down on jet engine noise, but it actually makes crying babies and conversations easier to hear. When I posted the review someone said "you really want some in-ear passive noise blocking earphones". I like the Audio Technica's and the biggest thing I learned from them is how awful the earphones that come with your mp3 player are -- not because they're miserable quality, but because they let in the sound of every passing truck, barking dog, and radio on your neighbors back porch -- your music gets mixed in with these things and if you dont want to hear them, you turn your music up louder. With noise isolating headphones all the sound from outside is blocked and all you hear is your music, which you can play at a lower volume, making for a much better listening experience. The big problem with my Audio Technicas, which I used extensively, is that they took up 30 or 40% of my "personal item" on the plane. they come in a huge case and although they "fold flat" they don't really fold small. Which got me interested in something smaller. What was that someone said about passive noise isolating earphones? While looking for the perfect winter coat I stumbled on a review of winter-wear on an audiophile website, head-fi.org, and read the reviews of in-ear noise canceling earphones. These are sort of a combination between a set of music playing earphones and those foamy earplugs that you use when you're at a gun range. Ultimate Ears Tripplefi 10vi's being eaten by Roswell to enhance value. These retail for $399, but last Black Friday there was a one day sale at some electronics retailer which was selling them for $99 and every audiophile in America took every penny they owned out of the bank and bought thirty pairs and has been selling them on Ebay for $175 for the last six months financing their $100 a foot speaker wire fetish. I'm not sure how to say this without it sounding like hyperbole, but they sound better than anything you've ever heard. You will find something you didn't know was in every single album you listen to -- whether it's extra instruments playing softly in one channel, or Glenn freaking Gould humming along while playing the Goldberg Variations (in fact, these headphones make that recording patently unlistenable because of all the background noise you didn't know existed -- you'll think he recorded it at a Lakers game). The UE10vi's have three speakers in them, hence their rather long tubular shape, a woofer, a midrange and a tweeter, with each speaker performing it's part independently, unlike your iPod's headphones which have one cone trying to make all the sounds at the same time. The sound is very flat without over pumped base or harsh high end. I'd like them a bit brighter, but that's because I'm a Philistine -- real audiophiles love their output. You're going to get better sound reproduction from these than from the fanciest speakers you have in your house. I wonder if we're all just headed that way, that we'll sit together with our private perfect headphones in listening to private perfect performances and only making hand signals to one another, like those kids in Pinball Wizard. One thing you notice right away is that these turn your head into a giant speaker. If you're eating celery with these in you will BE the celery. Also, the heavy cord transmits sounds like the string between two tin cans and every footfall you make is like the step of Godzilla coming to wreck your town. Luckily the headphones have rigid-bendy-wire right at the earphone, they say this is so you can "optionally" wear them with the wire hooked over your ears, it's not optional, you have to do it, and the wire going over your ears stops the noise traveling acoustically up the cable. Likewise, if you're wearing a coat with a hood made out of a textured fabric (like rip stop nylon as opposed to flannel) you'll hear it "voop voop"ing rather annoyingly as you walk. You squeeze the tips down, wrap a hand around your head, grab the back of your ear and stretch it out with one arm, and with the other push the squished plug into your ear canal, let go and everything expands to make a perfect fit. It works very well, but it's a bit of a pain in the rear. It's not like popping in the earphones that came with your iPod. It's enough of a process that you don't want to take them out and when someone stops you in the street and you pull your headphones out to hear what they're saying and they're giving you one of those "I just need $10 because my car was towed and I need to pick up my daughter at the hospital" scams you're slightly more outraged than you ought to be because you're not going to give them ten dollars for peppermint schnapps and on top of it you have to get your headphones back in your head. Ultimate Ears Tripplefi 10vi's not being eaten by Roswell. They come with a fancy but entirely impractical case with no hinge, it's weather proof so it's sealed very tightly, floats like a cork if you drop it in the ocean, but if you're not careful when you pop the lid off, everything comes flying out, from your spare foamy tips to the clever extension cable they give you so you can reach the back of your computer with them. There's got to be a better option on Etsy. One very very clever thing about these is that with the speakers themselves being so expensive, the wires are easily removable, so if they go bad, you can just replace them. You can also upgrade to a cable that has a microphone built in for use with your phone calls. My one suggestion would be that the earphones be different colors. There's a tiny L on one and a tiny R on the other, which you can't really see in the dark and it's a bit confusing as to which is which until you've stuck them both in backwards and the cable's jutting out past your nose. I'd put tape on one of them, but who knows what that would do to the fancy acoustics. It's a simple thing guys, maybe Red stripe on the Right earphone? or bumps? If you've got $175 and you've only ever listened to music on the headphones that came with your iPod, these will change your life. These headphones + Metallica > crying babies on airplanes which makes them aces in my book. They're much much much smaller than over-ear noise canceling phones and you don't need a battery for them. Ultimate Ears makes a few other options that are less expensive, some with two speakers instead of three, though my history over the years has not infrequently involved buying the wrong thing three times instead of the right thing once, so if you're on the fence, I'd recommend biting the bullet. 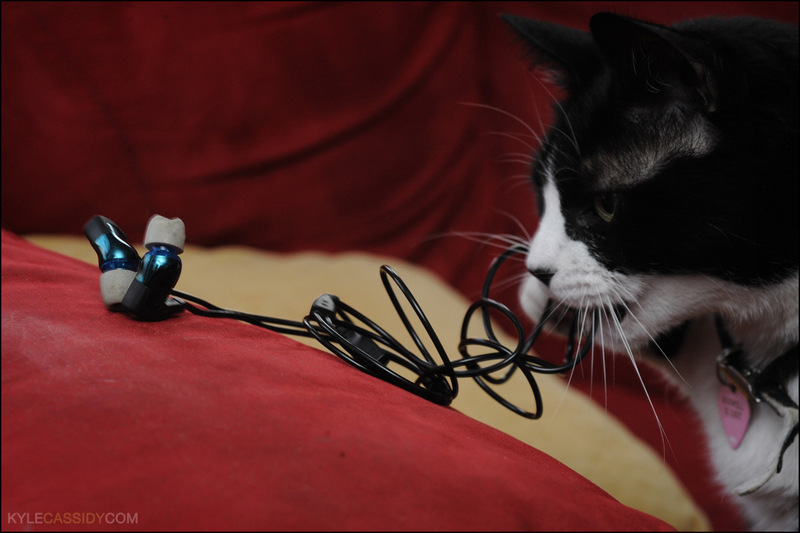 dude do NOT let roswell chew on $400 headphones, what's wrong with you? :) I know it's cute and all, but I've lost 3 pairs of headphones to my cats- when they bite through the wires they don't work so good anymore. Ah!! Unlike many headphones, these cables are detachable & easily replaceable saving your fancy speakers from damage. Chew, Roswell, chew! I want the ones with the microphone in the cord. that must be why they are $400. Why can't awesome technology like that be part of my $40 (former) headphones? The replacement cable for these is $40. But I'm sure for a 12 pack of beer someone within 3 blocks of your house will solder your ear pieces onto new wires. Oh yes, headphone reviews FTW. Do you know http://www.head-fi.org? You can happily waste hours there. Personally I'm a big fan of electrostatics, especially Stax electrostatics. Thata was indeed the website I stumbled onto. I like the Stax that look like waffle irons. I mean, I like how they look, I've never put a pair on. Yeah! They look so stupid that they obviously HAVE to sound great. And they do. P.S. Oh, sorry, I'm an idiot. Of course you did say that you'd found headfi.org. Pictures of the coat, please! Ever since I got the coat it hasn't gone below 47 here -- I'd die if I wore it. We were bbqing in the back yard last night. Global warming has made me IRRELEVANT! I guess I assumed you'd have a decorative mannequin somewhere in the house. oh, she can wear it (though she'd drown in it, it's a 2xl and she's an S) but i can't review it until it gets cold. snow would be nice too. I have been wearing the coat! there will be a review of the coat soon! Thank you for the reviews. It's one thing to read a review on a website, but it's much more helpful when someone you know talks about the pros and cons. Of course a dose of Roswell makes everything better. I'm some Sony noise cancelling headphones right now. I think I may very well splurge on these fabulous ones. Thank you so much for the fabulously helpful review! ETA: They're $164 via Amazon Prime! WHEE!!! Could you ask trillian_stars to try them out for size? Once when I couldn't get my beloved Etymotics I settled for Sennheiser but they turned out to be way too big. They came with different sized flanges but it was the actual speaker that was too large to fit into the ear canal. Having them hanging lose in the pinna cancels out the noise insulating properties, so I ended up giving them to a coworker with bigger ears. If she tries them I may never get them back. Ask her about my Leica bag sometime. The entire driver mechanism & housing is outside the ear. There's a post about the diameter of a toothpick that the ear plugs fit on and through which the sound travels. They do provide three different sized silicon ear pieces, but the foamies have a higher db reduction. It just dawned on me that I could probably put different colored foamy things on them -- one grey, one orange or something -- and that would likely do it. Ah, I've been dealing with this issue a lot lately since I study all the time and prefer to do it in coffee shops (just to make sure I'd know if the aliens invade or something). I've been using the JVC marshmallows since forever, which do the job to a certain degree, but lately I swear people have started living at a louder volume. I got the AudioTechnica M35s since they're supposed to be isolating - they're not. No dice. Returning them. You're totally right about the in-ears. I just ordered a pair of Sonys and a pair of GOgrooves for cheap - both get good reviews for isolation and ok ones for durability. I plan on trying out the Ultimate Ears 200s if they don't perform as well as I'd like. Ah, the complications of modern life! I would really like to try a pair of less expensive noise isolating earphones so I can compare them. I imagine that as long as the seal is good they'd be fine. But I'd love to compare. Wish granted! I'll be in Philly from 3/16-3/23. Mostly in West Philly, too. I actually got different colors since they were cheaper, so you can compare your grownup earbuds to cheapies that, for both sets combined, came out to $21. I'll bring the extra silicone thingies to make sure you can get a good seal/fair comparison. Exciting!